You could make this recipe in a single loaf tin, but the muffin tray ensures there's a mouthful of the deliciously crunchy crust with every bite. The individual portions also maximise the ratio of the chilli cheese topping to the tender, buttery interior. These make a great accompaniment to a family feast and are best at the height of summer, when fresh corn is at its peak, though frozen kernels are acceptable. They are also delicious served with soup. 1. Heat a medium frying pan until hot, then add the corn kernels. (Note: do not use oil as you want to char the corn rather than sauté it.) Once the kernels begin to take on some colour, stir lightly to stop them from catching. When the corn is nicely toasted with charred bits here and there, remove the pan from heat and set aside to cool. 2. Combine the flour, polenta, baking powder, salt, sugars, cumin and pepper in a medium bowl and set aside. 3. Whisk the eggs in a separate medium bowl, then add the yoghurt, milk and melted butter. Fold this into the dry ingredients and mix to combine, then add the toasted corn kernels. 4. Preheat the oven to 210C (190C fan-forced). Grease a 12-cup muffin tin with softened butter, then divide the batter among the 12 holes (an ice-cream scoop with a release mechanism works well for even distribution). Top each with grated cheese and chilli slices. Place on the middle shelf of the oven and bake for 18-20 minutes until the muffins are golden brown and a skewer inserted in the middle of a muffin comes out clean. 5. Remove from oven and allow to cool for a few minutes before turning out. 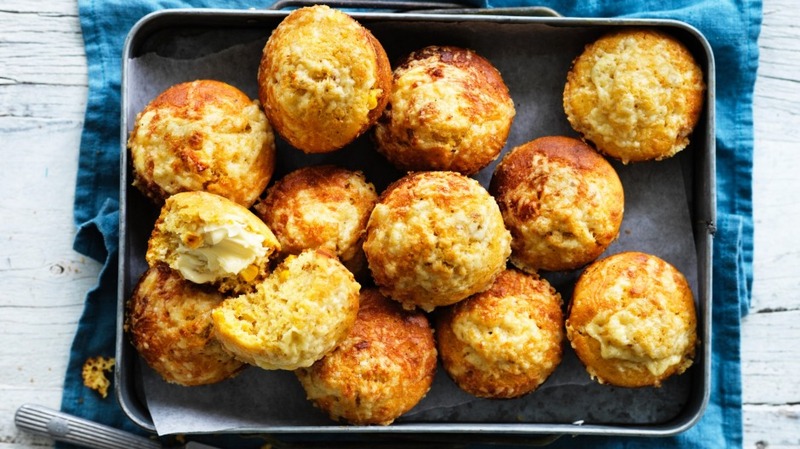 The muffins are best eaten on the day, split and buttered. Leftovers may be heated in a hot oven for 5 minutes.